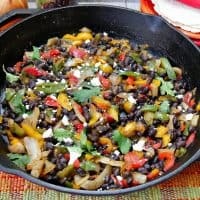 Whip up vegetarian fajitas with black beans, frozen onions and peppers, and a homemade fajita seasoning! Ready in about 15 minutes on the stove top, you can serve with tortillas, cheese and guacamole. 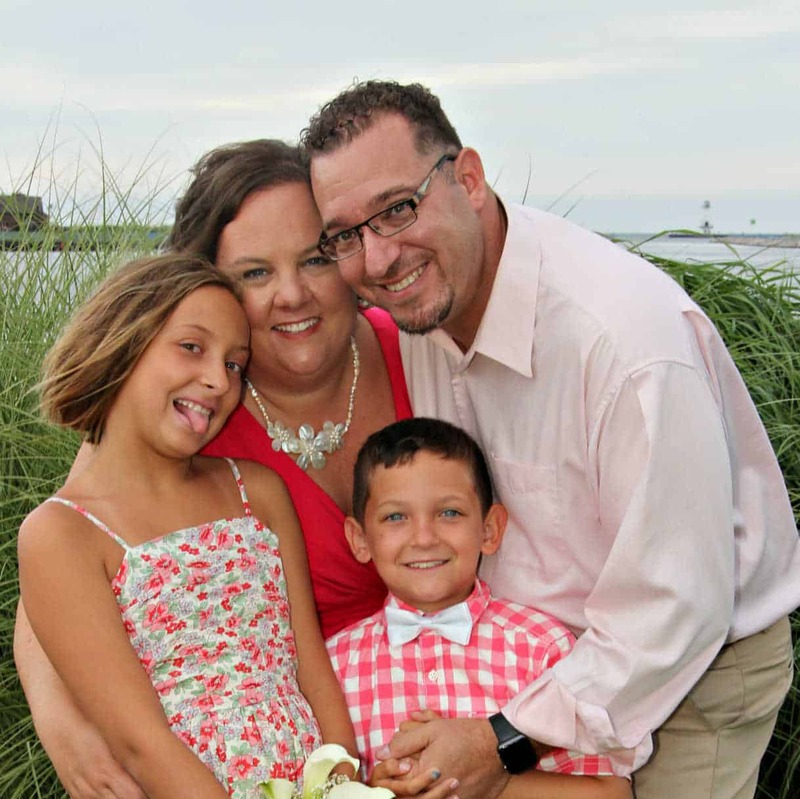 Have you ever bought a cookbook from one of your favorite chefs, got it home, and then wondered why you bought it? 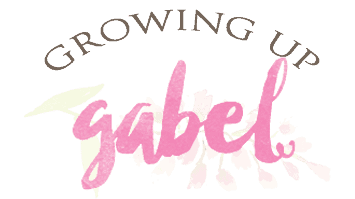 Most of us have a few cookbooks just sitting on our shelves doing nothing more than collecting dust. 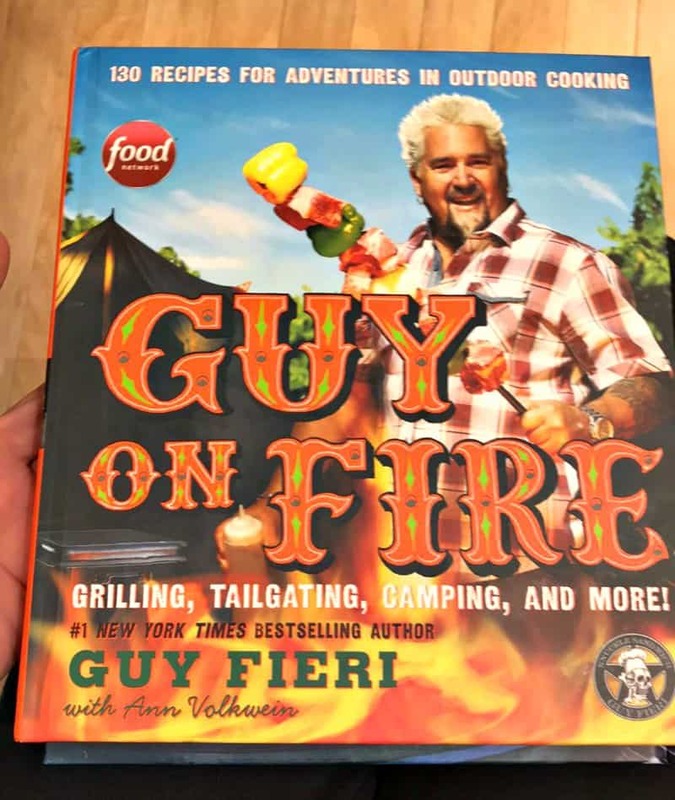 We do a lot of outdoor cooking so this book by Guy Fieri really looked like something I'd use often. But reality quickly sets in when you look for a recipe that doesn't require too much work or ingredients. 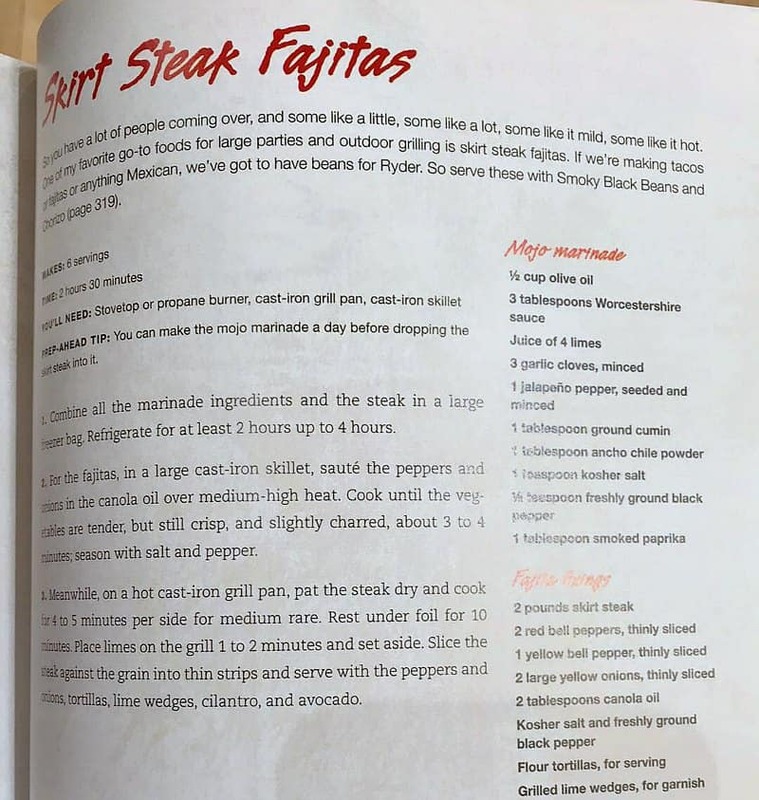 That fajita recipe looks amazing! But it also looks like a lot of planning ahead and quite a few ingredients. So instead of making this recipe, use it as inspiration. In this case, we switched out, well everything just about, to make vegetarian fajitas. And as a bonus, you can make them in one pan, no marinating necessary and they are ready in about 15 minutes. Now that's a dinner win! Canned and frozen foods are your lifesaver when it comes to getting a healthy dinner on the table quickly. 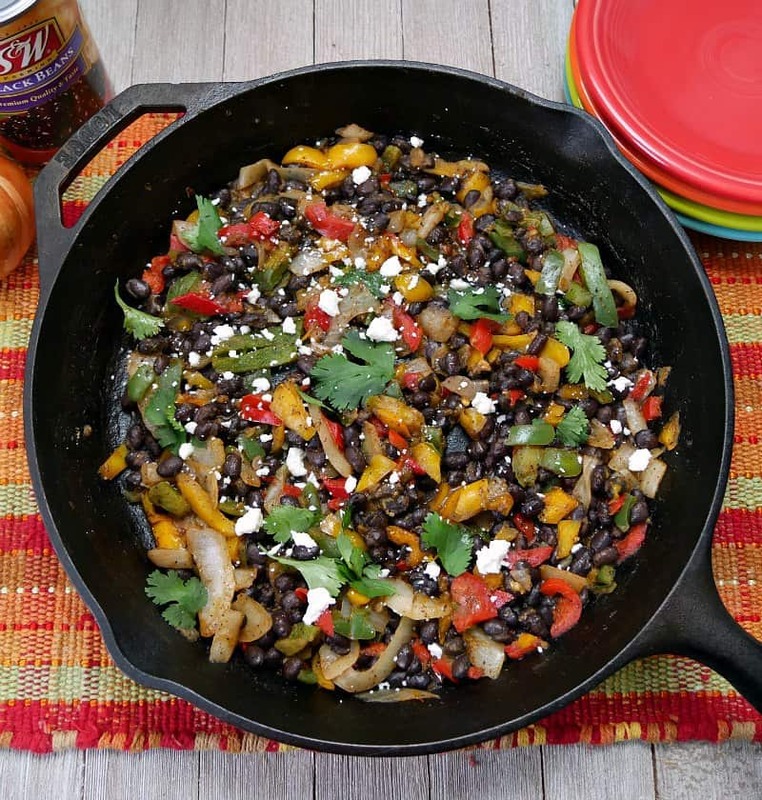 For this fajita recipe, we switched out the steak for beans for a protein source. 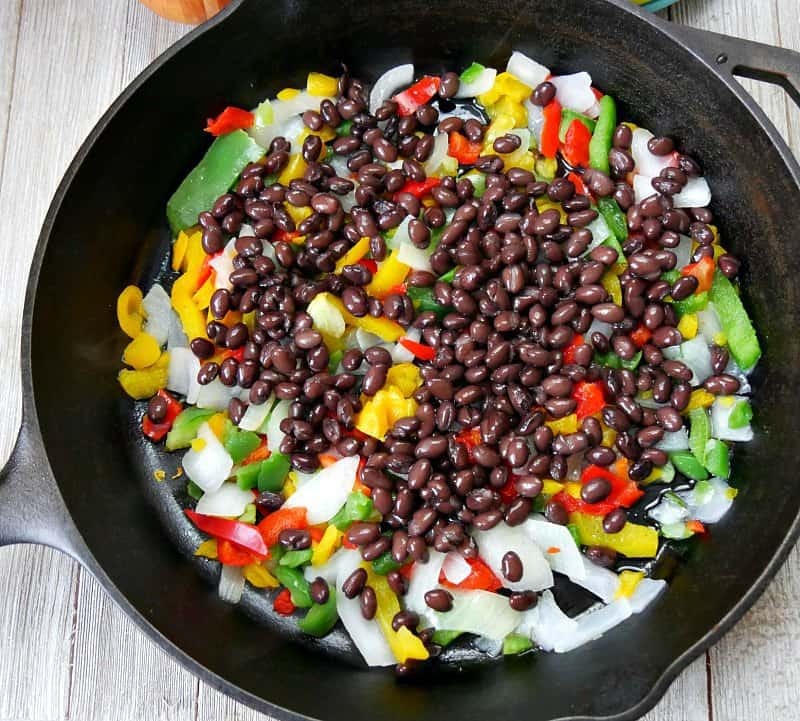 Keeping your pantry stocked with canned black beans helps give you protein options when making dinner. 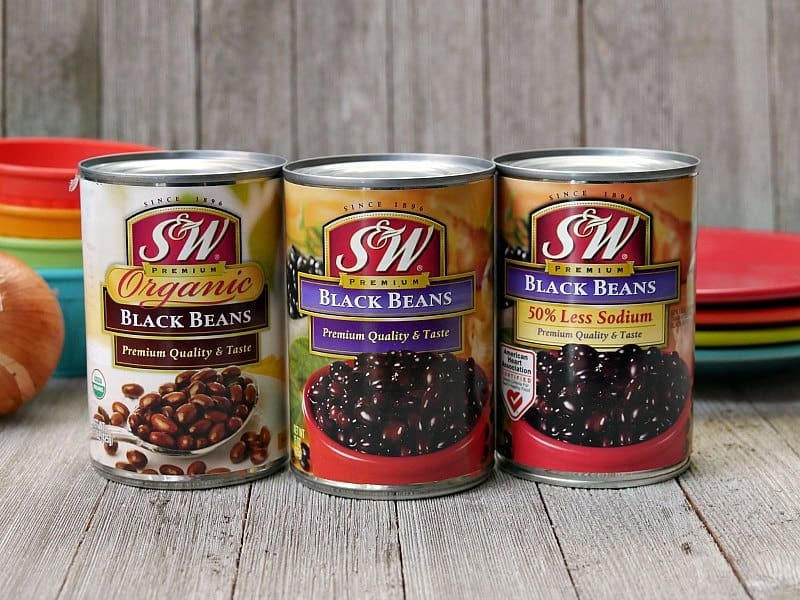 S&W beans have been around for over 120 years so you know they are premium quality beans. S&W beans are available in regular, organic and low sodium varieties so you can find one to fit your family. 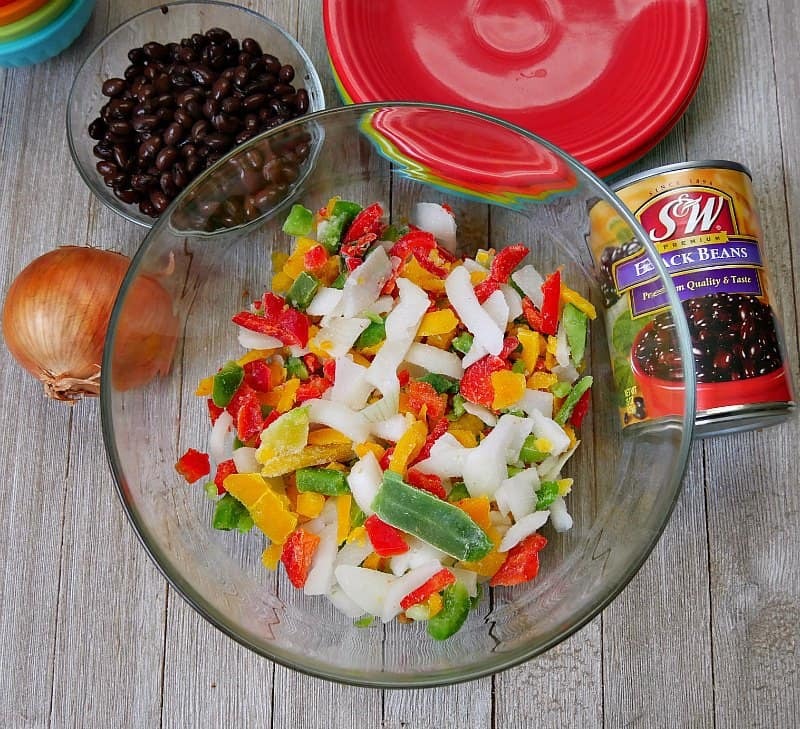 You can find more recipes for using S&W Beans online as well as a coupon so you can stock up. The next trick for these fajitas is to use frozen peppers and onions. You can, of course, use fresh peppers and onions. But keeping bags of the frozen options means less chopping and dinner gets on the table quicker. 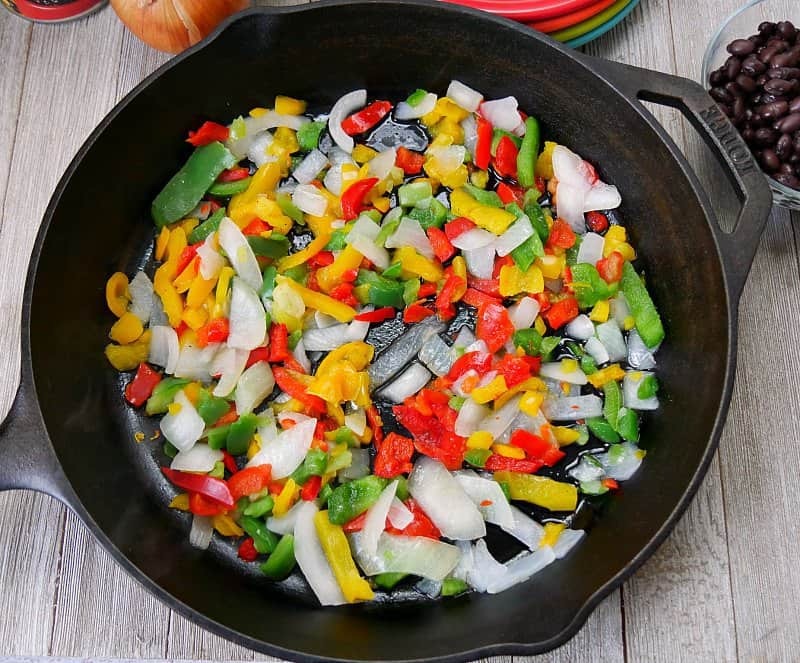 Start by cooking the onions and peppers in a large skillet over medium high heat. You just want to thaw the vegetables and get them nice and warm. I have found that it's easy overcook peppers and onions down to nothing so only cook these for a few minutes. 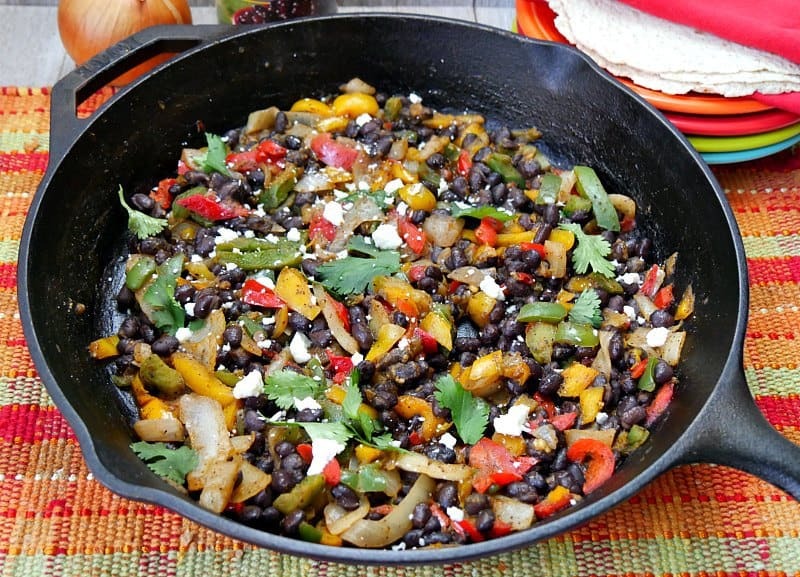 Once the vegetables are warmed up, add rinsed SW Black Beans. Any option of SW Beans is fine. Low sodium and organic work just as well as the regular beans. Stir the beans and vegetables together and then coat with fajita seasoning. I use homemade taco seasoning mixed with avocado oil for fajitas. You can use a homemade mix or a store bought mix and it can be taco or fajita. If you use taco seasoning, add corn starch to thicken the sauce. Cook the fajitas until warm and bubbly, just a few minutes. You may need to add a little water if needed for sauce. The frozen veggies should provide enough from thawing out, but sometimes a little extra is needed. Serve with warmed tortillas, cilantro, cheese and guacamole. Heat a Tablespoon of oil in a large skillet over medium high heat. While the skillet heats up, drain and rinse the black beans. 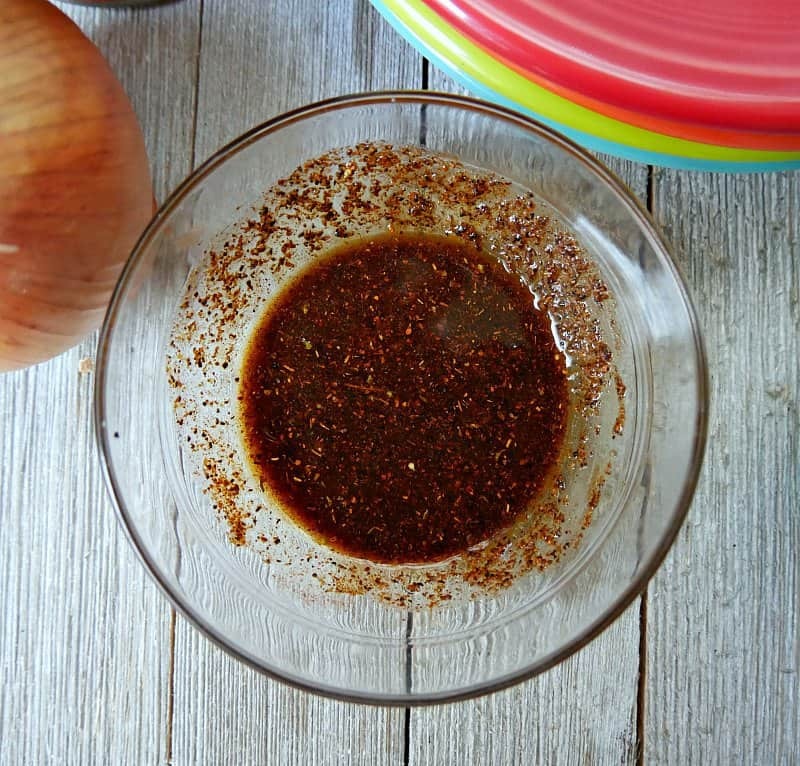 Mix the taco or fajita seasoning in a small bowl with the oil. Set aside. When the oil is hot, dump two bags of a onion and pepper mix into the skillet. Stir. Allow the vegetables to cook until thawed and warm, about 3 minutes. 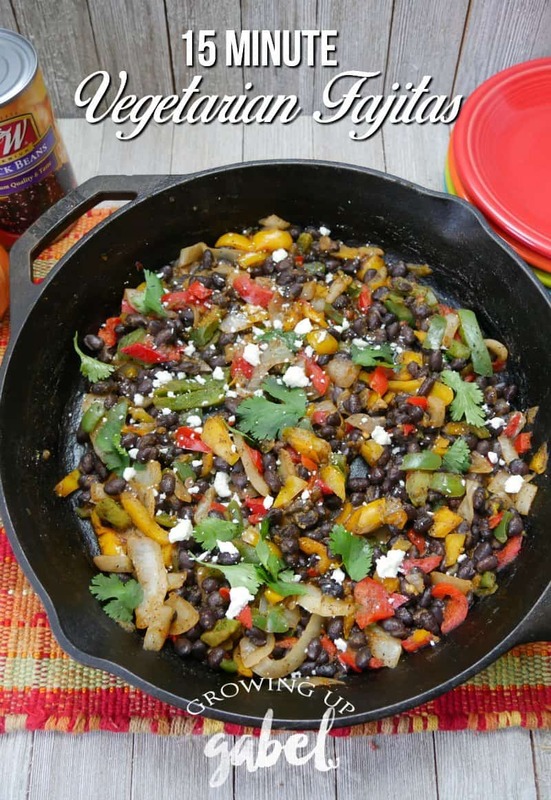 Add black beans to the skillet and stir to combine with the vegetables. Add the fajita seasoning and stir to coat the beans and vegetables. Add more seasoning as desired. Allow the mixture to cook for 1-2 minutes. Stir in the corn starch to thicken the juices. You may need to add a Tablespoon of water. Remove from heat and serve in warmed tortillas with sides of cilantro, crumbling Mexican cheese, sour cream and guacamole.